Tune in to Late City Edition this Tuesday night for a conversation with journalist Nina Munk. 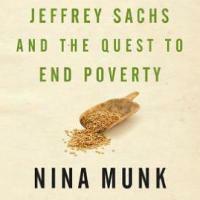 After six years of research, Munk has written The Idealist, a book doccumenting the efforts of Jeffrey Sachs in global sustainable development. Sachs is a professor at Columbia University and the director of the Earth Institute. His brainchild, the Millennium Villages Project, is meant to put his economic theories into action to lift various African communities out of an endless cycle of poverty--the "poverty trap."